We’re FINALLY moving forward with the platform bed. After this round of construction it actually resembles a place you could lay down and take a snooze. In today’s episode we construct the platform itself. 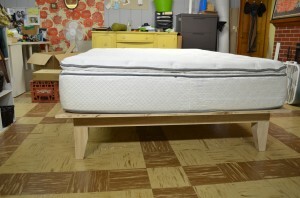 A simple mitered frame that gets attached to the “undercarriage” and a series of slats to keep the mattress from falling through the larger openings. Perhaps the hardest part of the build today was dragging my son’s mattress into the basement for the test fit. Even gluing the miters together was made easier thanks to a sample of Nexabond’s 2500L C.A. glue. It’s much longer open time than traditional C.A. glues made it easier to use without worrying about parts sticking to me or the floor. Don’t you know that biscuits are crap and the Domino is KING? That frame will fall apart the first time you sneeze at it, ask the wood whisperer clown he would know…………. JK I know you do not advertise for the tools most of us can’t afford…..
That was a close one…I was worried I might have to say something snappy in response lol! I think I prefer biscuits because they sound yummy! Thanks for the latest video edition. I have have heard about using this new cyanoacrylate (sp?) wood glue, but have not heard about using it with biscuits. I am wondering if the biscuits would absorb the glue and swell up the biscuits as a water based titebond type glue would. It might be interesting to saturate a couple of biscuits in each of the glue and let them dry to see what the result would be. Just a quick question on using CA glue with biscuits, isn’t the water in PVA glue supposed to swell the biscuit to help it hold where as CA glue wouldn’t do that? If it works then the point is moot but I just wouldn’t want your son to flop down on his bed only to have the mitres (yes, I use Canadian/British spelling) snap apart. One other thing that came to mind was using dowels as permanent (but not glued) registration pins for the pine slats. Just a thought. I’ve heard that about biscuits and PVA glue, I’m sure it’s true also. After attaching the platform to the undercarriage I’m confident the miters should hold tight regardless. Besides, the way the mattress sits over them no one will really notice lol! How come you didn’t draw the miters together with your Kreg pocket hole set. That would have added more rigid strength then biscuits. It’ll also be interesting to see how that CA glue holds up. I had originally kicked the idea around but I wanted a cleaner look. The wooden plugs would have been fine to hide the screws, but I still wanted them completely hidden…of course in reality no one will see them at all unless they’re laying on the floor looking up LOL! I think the CA glue should work good in this application, although I don’t plan for this to be a regular routine use of it. The bed looks great! Do you plan to use some dowels, etc, to keep the slats from shifting around, or are you going to leave them loose? It was a close call for sure. There was some sticking to the floor, but thankfully it was caught early enough not to be a problem LOL! I’ll probably just let the slats roam free, I’m starting to become a fan of free-range bed slats. Matt – what were the clamps you used on the corners? I couldn’t tell from the distance. « You dang blade guides!